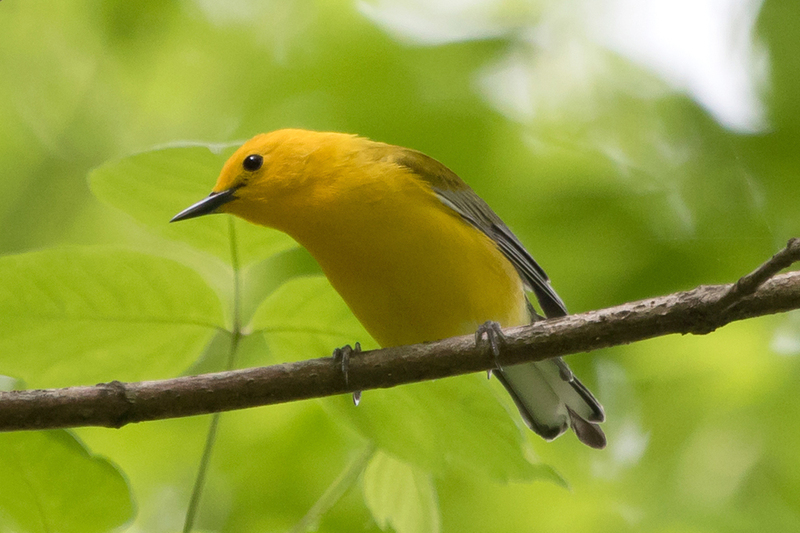 Spring: Prothonotary Warblers are beautiful birds who are rarely seen at Monticello Park; during many years, none pass through. They prefer swamp habitat. They nest in numerous parks in the Washington metro area, including Huntley Meadows and Occoquan Bay National Wildlife Refuge. 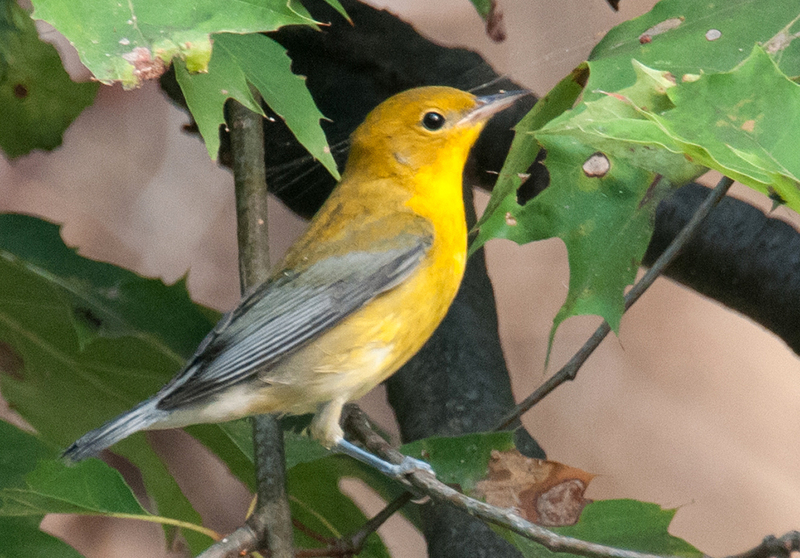 Fall: A Prothonotary Warbler has never been recorded at Monticello during the fall. 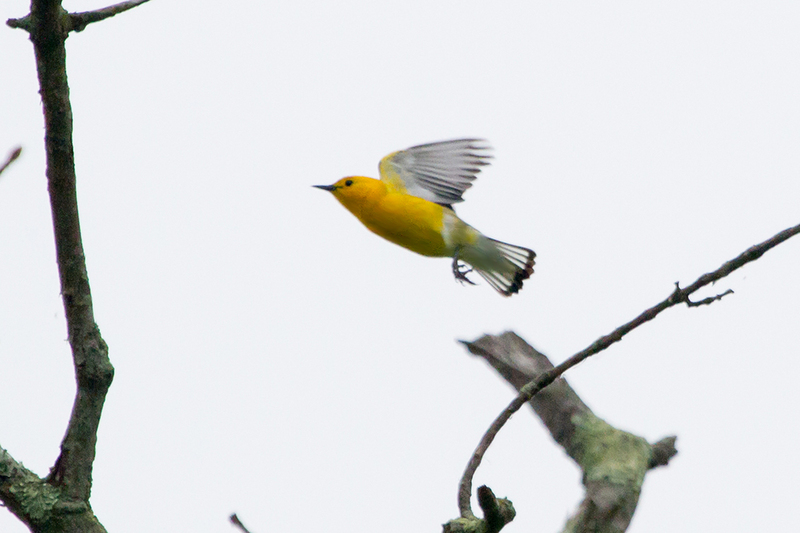 There is no good place to see Prothonotary Warblers at Monticello. When they visit the park, they often hop around near the stream. The male Prothonotary is bright yellow with an olive back and blue-gray wings with no wingbars. The black eye stands out against the yellow face, and the bill looks like a large black peg. He looks round rather than sleek. The yellow can look orange when seen in bright sunlight. Females resemble the males, but have duller plumage. The feathers on her head are olive like the ones on her back rather than yellow like the ones on her throat. 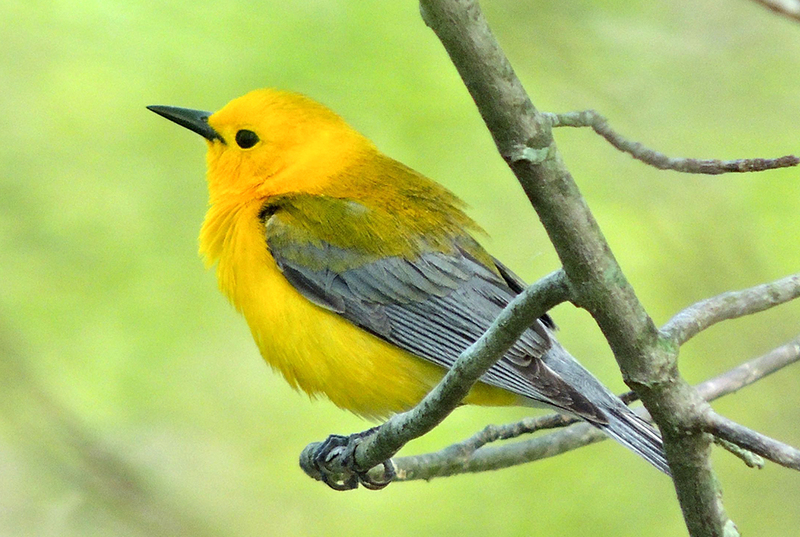 The Prothonotary Warbler is the only bird species in our area who actually sings tweet-tweet-tweet-tweet-tweet. The song is loud and clear. 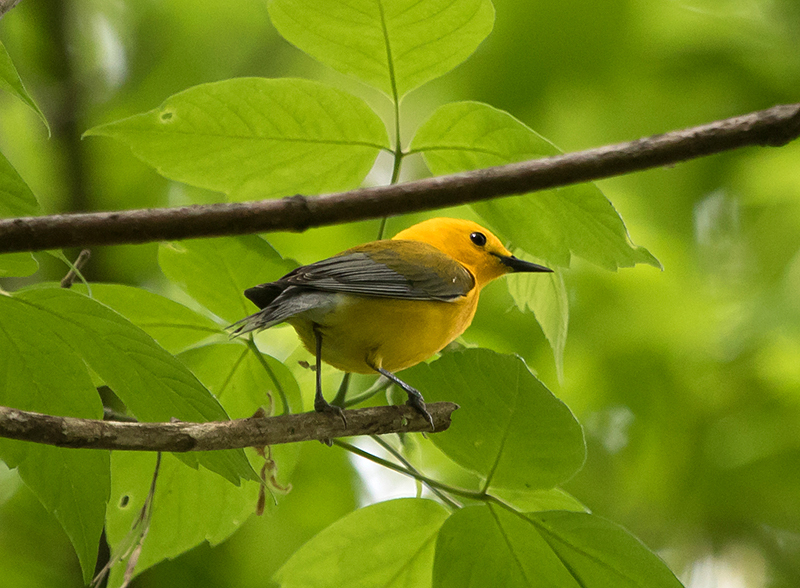 Hear the vocalizations of the Prothonotary Warbler. 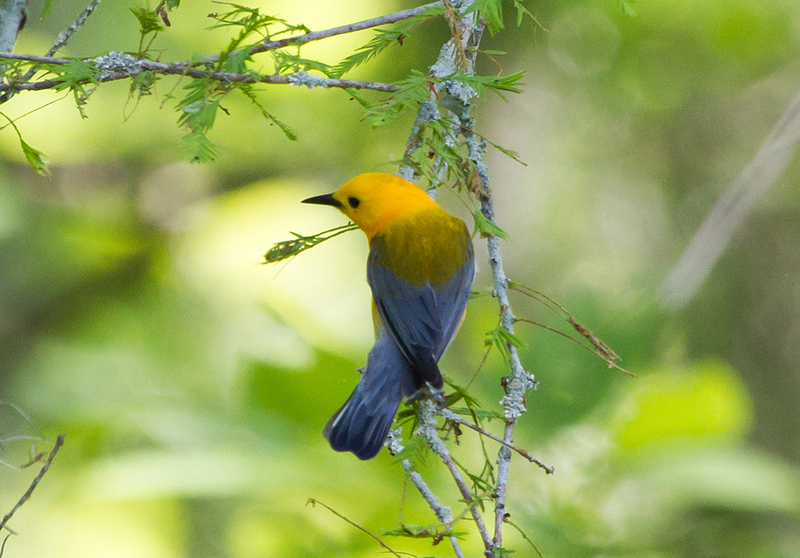 The Prothonotary Warbler is named after Catholic scribes; the last six letters of the name are "notary". The reason for the warbler's name is unclear, because contrary to popular belief, the scribes did not wear yellow robes. Many places in Pennsylvania have had prothonotary offices that record documents for various civil procedures. The prothonotary office in Philadelphia is thought to be the oldest continuously held legal office in the Western Hemisphere — the first person to head it was appointed by William Penn in 1683. However, because a lot of people apparently did not know what a prothonotary is, the name of the office has since been changed to the "Office of Judicial Records — Civil". Common Name: Prothonotary from Catholic scribes. 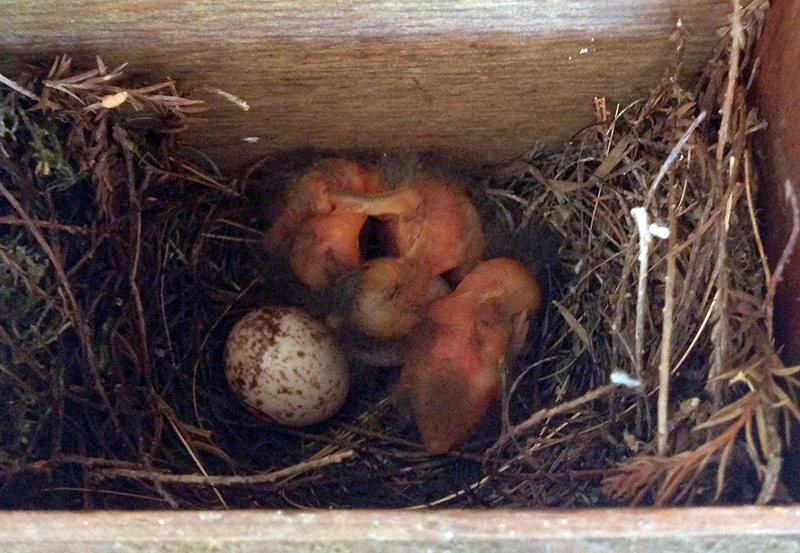 The New World Warblers were named for their similar appearance to European warblers, to whom they are not related. Most of the New World warblers do not warble (sing continuously with notes that change frequently). Genus Name: Protonotaria from a Greek word meaning "first scribe". Species Name: Citrea means "like a citrus tree", from the yellow plumage.